« Oz Yarn Club – Nov. and Dec.
Isn’t it adorable? It’s a Panasonic Lumix DMC FS7. 10 megapixels, AWESOME macro mode (one of the things my old one lacked), nice big LCD screen… and it’s a perfect emerald Elphaba green. 😀 Thanks, sweetheart! Another new thing – a new WIP! 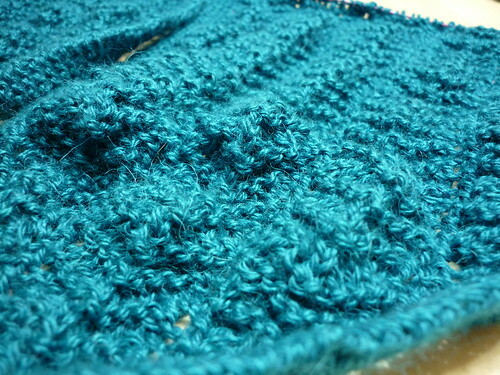 This is the Clementine Shawlette from Interweave Knits Spring 2007. I picked up the yarn – Blue Sky Alpacas Alpaca and Silk in Jade – when I went down to see Cristi for SAFF in ’07, and it’s been waiting for this ever since. 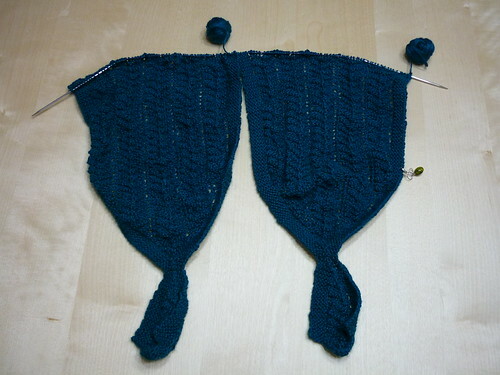 I’m about 2/3 of the way through it, knitting both ends at once, just because I know I won’t finish it if I do them separately. Of course, I do have to kitchener them together, but we’ll tackle that when we get to it. See what I mean about the macro? 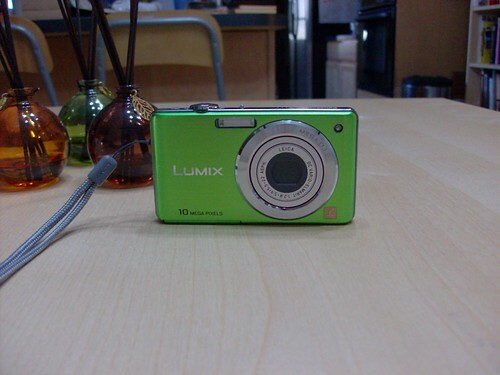 It even has two – manual zoom and an autofocus macro. And the third “new thing” (Those of you on FB and Twitter may have seen this)… I have a job. That’s right – after five and a half years as a homemaker, I am once again among the gainfully employed. I’m going to be working for a local indie yarn dyer, starting with stuff like hauling dyepots, rinsing and hanging yarn, and eventually learning to dye myself. I’ve met most of the women I’ll be working with, and they are awesome. It’s going to be hard work, but I think I’m really going to have fun. I’ll be working four days a week, so I may be scarce (um… scarcER) for a bit around the blog until I get into a groove with it. December 11th, 2009 | Category: Misc. Nice camera and GORGEOUS shawlette! Congrats again on the new job – I’m so excited for you! Oooo, preeeety new camera. LOVE the green! What great news! I was all “neat green camera” and “cool shawl halves” and then wait what? Sounds like a great job for you, too. Congrats! Congrats on the job- sounds like it’ll be perfect for ya! I love the Clementine, one reason I bought that issue. I just bought my mom a new digital camera today. Of course, that purchase was driven by three things: simplicity, batteries and simplicity. Shawl looks good and yay on the job! Belated congratulations on the job, Pam! So happy for you!